running an ultima ignition. 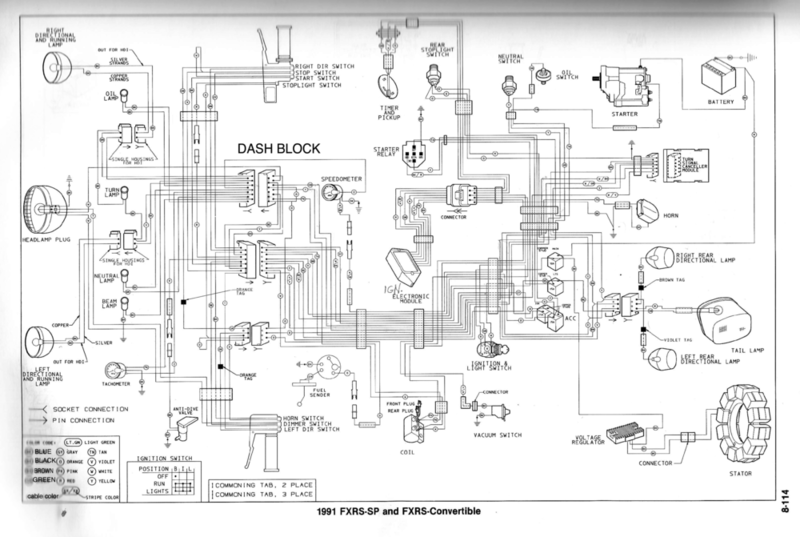 This simplifies the wiring somewhat in that we can disconnect the ECM and run one harness from the timing and pickup to the coil and then up to the VOES and tach. There's no VOES. I have one on order and will hopefully run it but in the meantime am hoping to get the bike on the road without. The dash I have appears to be accurate to the year based on the user's manual and other materials but has a spot for the ignition key. The bike frame and harness I have are expecting the ignition more in the mid-frame by the coil and rear cylinder. There's no horn. I may change this or hook one up just to eliminate more wires and test the switches. Gerry, a fellow FXR owner at Lucky Wheels in LA has been extremely helpful and has sent me some pictures, diagram and graphics which I have since embellished upon. Gerry sent this picture to me and it has proven exceeding useful as it shows where things actually exist on the bike and what connectors to expect. No idea about primary source but it's awesome. Thanks Gerry! 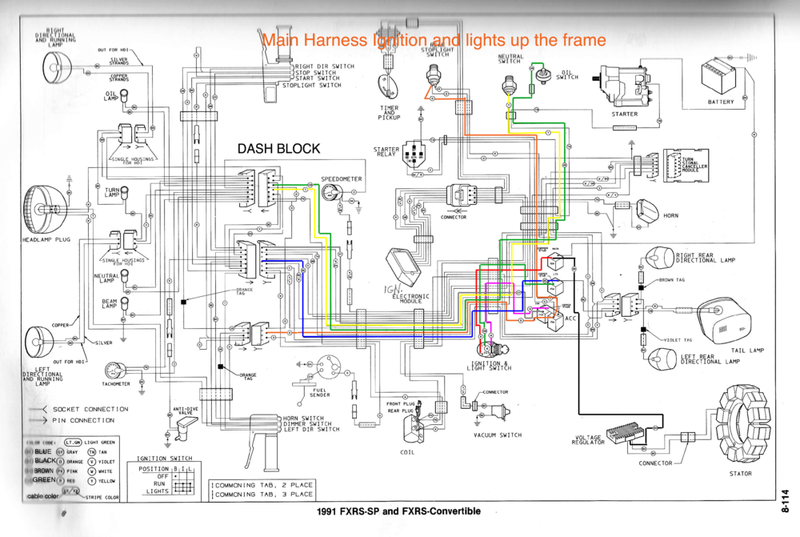 This diagram illustrates the necessary main harness connections for basic lights and ignition switch. This could be considered a "Step 1" for wiring. You can rough in the harness. Not included in this diagram is the timing and starting circuit. This is the starting circuit and colors in the necessary connections for starting. Most of these are again in the main harness but it made some sense to separate this because some of the colors overlap with the lights and I wanted to make it into a step 2. This describes the ignition and timing circuit for hooking up an Utlima aftermarket ignition. I have intentionally left the Tachometer connection open as I have not yet had a chance to look at it. Note: for obvious reasons, white is indicated with magenta. This jumper connects the main harness and block to the right switch block.